The mortgage insurance-linked securities (ILS) or insurance-linked note market is primed for expansion, as more of the U.S. private mortgage insurers look to leverage the capital markets as a source of reinsurance capacity and as a capital management tool. The mortgage insurance-linked securities (ILS) market sees private mortgage insurers transferring some of their mortgage insurance portfolio risk to capital markets investors in much the same way that a property insurer might transfer peak catastrophe exposures using a catastrophe bond. In fact, the mortgage ILS structures look and feel very similar to a catastrophe bond, underlying risk aside, using the same special purpose insurance vehicles, structuring methodologies and mechanisms to securitize insurance risks into a note form that can be sold to institutional investors. Of course, with mortgage insurance risk being the underlying peril, these mortgage ILS bonds are exposed to default or credit risk on the securitized pool of mortgage insurance policies as well, meaning they do not exhibit the same lack of correlation to broader financial market factors that say a cat bond would. However, while the ILS funds of the world tend not to be big investors in mortgage ILS, if at all in the majority of cases, some of the end-investors in ILS do allocate to these mortgage ILS deals, as do many of the multi-strategy investors that also allocate to ILS funds, catastrophe bonds and other types of collateralized reinsurance investment products. In a recent report, rating agency A.M. Best highlighted the efficacy of this strategy for mortgage insurers, as they have successfully opened up the capital markets as a source of capacity to diversify and augment their reinsurance provisions, as well as to support their capital management activities. Ever since the introduction of the Private Mortgage Insurer Eligibility Requirements (PMIERs) there has been an increasing need for insurers to utilise reinsurance as part of their capital management toolkit. The mortgage ILS market now promises to become an increasing component of this as well, with significant growth witnessed in recent years as mortgage insurers look to the capital markets for reinsurance protection. The first mortgage ILS transaction was completed in 2015 by United Guaranty, at the time a subsidiary of AIG but subsequently acquired by Bermudian re/insurer Arch Capital Group. AIG followed up in 2016 with a second transaction under the Bellemeade Re series of mortgage ILS deals in 2016, but remained the only sponsor in this emerging insurance-linked securities (ILS) market for mortgage insurance risk. Then in 2017 other sponsors began to take the lead from AIG, as National Mortgage Insurance Corporation became the first to issue a mortgage ILS deal that year, followed by Arch Capital with the third Bellemeade Re deal, soon afer its acquisition of AIG’s United Guaranty. But still the mortgage ILS market remained a small component of overall ILS market activity. Until 2018 that is, when the mortgage ILS market exploded, resulting in an impressive near $3 billion of mortgage insurance-linked securities (ILS) issued during the year. New sponsors that came to market included Essent Guaranty, MGIC Investment Corporation and Radian Guaranty, all with their first mortgage ILS deals. In addition, Arch sponsored three Bellemeade Re transactions (details of these can be found in our ILS Deal Directory) and NMI came back for its second Oaktown Re deal. So far in 2019, one mortgage ILS deal has been completed for Essent Guaranty and another has recently been completed by Arch again, but we understand from sources that 2019 should see a roughly similar volume of mortgage ILS issuance to the prior year, which will please investors. 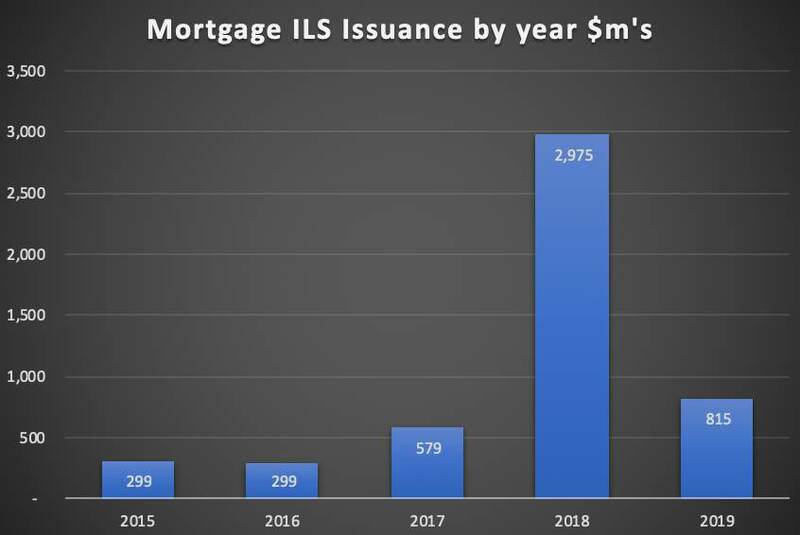 The chart above shows the explosive growth of mortgage ILS issuance in 2018 and with 2019 set to see similarly brisk activity, we’re told, mortgage insurance risk is going to become an increasing investment opportunity for many. Arch, with its expansive use of ILS, has now become one of the largest sponsors of 144A structured insurance-linked securities (ILS), thanks to its mortgage transactions. Other major mortgage insurers are looking at the market and those that have issued in the last couple of years are all expected to return, given the cost-of-capital for mortgage ILS is very compelling compared to buying increasing volumes of traditional indemnity reinsurance. As a result, this mortgage ILS market is expected to continue its expansion over the coming years, something rating agency A.M. Best agrees with. “AM Best anticipates that the private mortgage insurance (PMI) industry will continue to cede more risk to capital market participants through the issuance of mortgage insurance-linked securities (MILS),” the rating agency said in a recent report. The rating agency explains that, “PMIs also have continued to cede more of their risk to the reinsurance market through various quota share and excess-of-loss programs, which serve as mechanisms to reduce potential losses in case of a market downturn. Tapping the capital markets was a natural progression of this trend, as the mortgage insurers looked for diversified sources of reinsurance capacity and to access the lowest cost-of-capital possible. A.M. Best also notes that, “Mortgage Insurance-Linked Securities provides a way to manage capital following the introduction of PMIERs,” which has really helped to drive the mortgage ILS market forwards. But the use of mortgage ILS has also been used as a driver for front-end underwriting growth, as by opening up a channel to the capital markets these insurers can leverage that capacity to manage their PML’s and write more business as well. Arch has become a master at this, alongside its other innovative initiatives on the front-end of its mortgage insurance risk origination and assumption business. These see the company originating increasing amounts of risk through a pipeline that connects through to reinsurance capital providers and as these programs expand we can expect Bellemeade Re to do so as well, with the capital markets becoming an increasingly important capacity provider we’d imagine. Overall the mortgage ILS market has much promise and is likely to expand significantly over time. As we said earlier, it doesn’t suit all ILS investors, which does present a conundrum for us. At some point in the future we may break mortgage ILS deals out of our catastrophe bond and ILS Deal Directory, else they may start to dominate and obfuscate the underlying catastrophe linked transactions. But for now we continue to cover them along with the catastrophe-linked ILS deals, given the structural similarity, aligned motivations of sponsors and similar investor appetites. One point that should be stressed on mortgage ILS, is that this could become an extremely attractive asset class for insurers, pensions and other institutions looking for relatively long-dated assets. Large institutional investors often find deploying capital challenging at the moment, given a dearth of good and expansive asset classes right now. This has led to many electing to create their own investment opportunities in areas such as infrastructure and development. But mortgage ILS offers a lot of what these large investors are looking for and yet so many of them are unaware of the existence of this niche. Which suggests that as they discover it, the appetite for more mortgage insurance risk in ILS form could grow significantly, stimulating issuers to tap the capital markets even more and players like Arch to put securitization firmly at the centre of their mortgage insurance business plans.